I heard this statement last night from Michal Barak, an Israeli lawyer who is among the founders of the new organization Women Wage Peace. Michal came to Cambridge with the Palastinian-Israeli social worker Samah Salaime Egbariya, to discuss their experience of despair during the Gaza war last summer and to tell about their initiative of a women-led peace movement in Israel, which has gathered momentum towards the upcoming general elections in March. 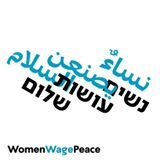 Women wage peace is a non-partisan movement aimed at raising awareness among politicians and the general public of the need for a permanent peace agreement between Israel and Palestine. It gathers over 8,000 women who share a commitment for peace, if nothing else. WIthout offering a specific solution to the middle east conflict, the organization invites citizens and politicians to engage in fruitful discussions and eventually negotiations for a peace agreement (rather than temporary settlement). I’ve been a member of this organization since the summer, and followed their activities, mostly online. What is the value of women peace movement? This question has two parts: first, what is the value of women as political activists, and second, why found another non-partisan movement when decision-making is evidently centred in the parties and the parliament. In reply to the first question, women activists said that they felt more at ease to express their view in feminine company, because the reaction of men to their ideas about politics, security and military issues was dismissive and impatient. They felt that despite the fact that there are leading women in Israeli politics, a woman is not taken as seriously as men. Often, women are not invited to debates on national security and politics (they take more active part in debates on social issues). A women-led movement would allow women to express themselves freely. However, can we, and should we stretch this argument to say that women have a distinct voice in political debate, that is fundamentally different from men’s? Do they bring a different vision, shaped by their experience as women? I can easily think about women who were political activists for a variety of causes: first of all feminism and gender equality, but also racial equality, world federation, European peace, and much more. Would their action be more effective within a female-led group? Some women say that they feel more comfortable to express themselves among other women. While I can easily identify with this feeling, I strongly believe that the challenge remains to go out there and establish the feminine voice as a legitimate one in a mixed society, as a representative of a particular worldview and not of women as such. While there is nothing inherently wrong in a group of women calling for change, I am concerned by the argument that women feel more comfortable to act and speak out among women. This may perpetuate, rather than help overcome, their difficulties. The answer to the second question, whether there is need for another peace movement, is, for me, more evident. Yes. In the current situation, an organization that groups people from different backgrounds, beliefs, religions and places, around a shared goal of peace, is doubtfully important. The growing despair in the Israeli public about possible solutions for the conflict calls for a grassroots movement promoting change. Yet for me the final test remains the movement’s ability to impact decision making in the parliament. Its activities should go well beyond the online sphere or the crossroads manifestations. As much as one wants to talk about change from below, the social protest of 2011 shows that effective change can only be attained within political institutions. Only when elected to parliament did the protest leaders have the power to influence socio-economic politics. Last night was inspiring and encouraging. The women who decided to dedicate time and energies to promote peace deserve more media and public attention. But in my view, they deserve that not because they are women, but because their cause is right.